‘If there’s a particular hair that I can’t get to with my finger, then I dig under my skin with a pair of tweezers to get to the root of the hair to pull it out. ‘I enter a sort of trance. I’m not really thinking anything when I pull my hair out. ‘It gives me relief doing it because it lowers my anxiety. ‘It’s something that I know that I have no power over, and unless you’ve been in my shoes with this particular condition you can’t truly understand what it’s like. ‘There are times where I don’t feel like I have a choice, because it consumes me. ‘The bullying was pretty much every day for five or six years at high school. ‘That’s a certain level of emotional trauma, and even as an adult I still have flashbacks to being bullied. Nate said he was bullied for being gay every day for nearly five years, between the ages of 12 and 16, and it stopped him making friends. He said his peers ganged up on him, taunting him and calling him homophobic names, and he quickly became the school pariah – and teachers did nothing to stop it. He said he started pulling his hair out aged 15, to deal with the stress. Trichotillomania, also known as trich, is when someone can’t resist the urge to pull out their hair, and sufferers often feel a sense of relief afterwards. ‘I wasn’t physically bullied, but it was constant name calling,’ he said. ‘I was bullied for my sexuality before I even understood more about my sexuality — they were calling me “gay boy” and I didn’t know I was gay until I was 15. Nate said PE classes were the worst, because he’d be taunted by large groups of boys in the changing rooms and was frequently picked last for teams. ‘Twenty years ago, sexuality wasn’t something that was talked about especially in school – particularly in a Catholic school,’ he said. ‘The teachers heard the names that I was being called, and they’d see the kids throw rubbers and pencils at me in class – but they never intervened. ‘They never took me to one side to ask if I was okay. ‘Looking back, I wonder if as a Catholic school, the staff didn’t think they could raise the subject of sexuality with me too much, if at all. Nate came out as gay when he was 15, and began to pull out clumps of hair from his scalp, arms, chest, and eyebrows. Nate, who also has OCD, was officially diagnosed when he was 22. Now he’s pulled so much hair out from his head over the years that some patches won’t grow back. And Nate has done so much damage to the follicles on his brows that he had them tattooed on last year. He described the experience as a mental illness over which he has no control, and said he was addicted. Nate takes antidepressants, undergoes cognitive behavioural therapy, and even has a psychotherapy treatment called Eye Movement Desensitization and Reprocessing. But he said the biggest turning point came when a friend of his finally convinced him to shave his head and accept his condition. ‘John was the first one to encourage me to shave my head, and to embrace it and accept it as a part of me, rather than as something to be ashamed of. ‘When I was 22 I was diagnosed with OCD — I used to be obsessed with checking locks on doors, and leaving the house made me anxious. ‘I was weird about taps being left on, so I used to turn the taps really tight. ‘A lot of people know what OCD is – but as soon as you mention hair pulling they think it’s disturbing and a really weird thing to do. ‘It has been hard to speak about it with people because I have had people question if I’m really ill — that’s been with friends and colleagues. He finally felt able to tell his parents about the school bullying he endured two months ago. ‘It was like this massive weight off my shoulders that was being lifted,’ he said. Nate now shaves his head every two to three days to curb his urge to pull but has learned to accept the condition rather than fight it too much. He said there’s a lot of pressure amongst trich sufferers to stop, and though he’d sometimes last 24 hours not pulling, he’d relapse and beat himself up about it. ‘I don’t know if I’ll ever be able to ‘stop’ doing it, but I’d definitely say that I’m a step closer to making peace with it,’ he said. According to UK charity Trichotillomania Support, the disorder is now a recognised body-focused repetitive behaviour alongside skin picking. 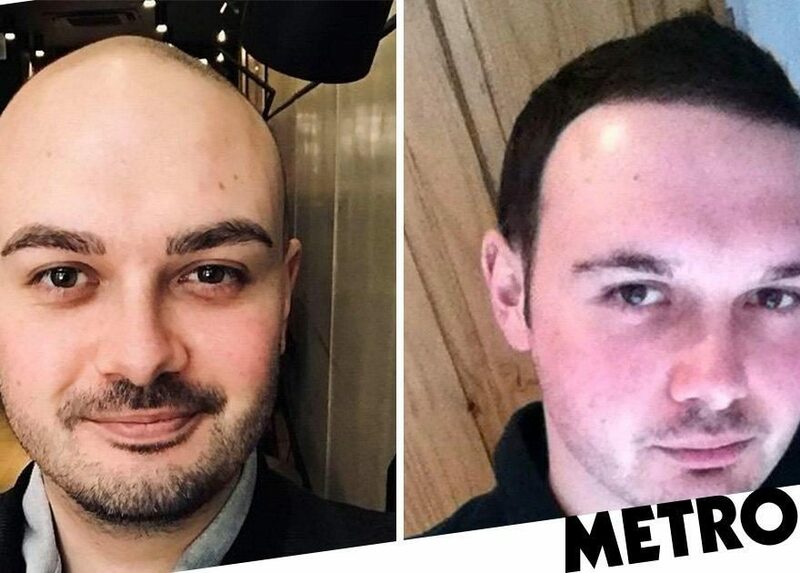 Nate wants to set an example for men in the UK who suffer in silence with trich. He said the media hasn’t done enough to address the issue among men, and treat trich largely as a female affliction. ‘It’s mainly a female affliction so I don’t think that men have been well represented in the media about OCD and hair pulling,’ he said. ‘It’s an emasculating thing for a man to go through because it’s kind of accepted that women remove their hair through waxing or with tweezers. ‘And women who pull hair wear wigs and put on false eyelashes, but it’s uncommon for a man to wear false eyelashes or wear a wig – and I never would. ‘There’s probably a lot of men that suffer from it and don’t talk about it.